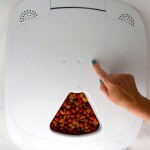 Hoison is an automatic pet feeder that features 10 functions to feed and interact with your pet. 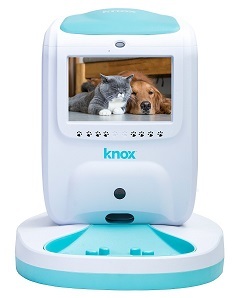 With this unit, you can feed, talk and see your cat from anywhere on your SmartPhone so if you are working or traveling you can check on your cat anytime and video/voice interact with your pet. Also, you can program your pet’s feeding schedule from your Smartphone and change it at any time if needed. By signing in your “Wetchat” account (Wetchat is a Chinese mobile App), you can feed your pet in real time by pushing the “Feed” button or take pictures of it. The feeder registers and stores data in the Cloud service about how much food your cat ate over a week, showing you a report on your SmartPhone. Also, the unit suggests you a healthy feeding plan for your pet based on its eating behavior. With a smart weigh sensor the unit registers how much food is left in the feeder with a 2g margin error. With this information, you know when it’s time to buy more food. The portions increases for “cups” and each “cup” is equal to 30 gr. (approx. 1/4 US cup). The unit has a special re-connection system that works in case of loss of signal so you don’t have to worry about re-connecting your feeder. The device will keep working no matter what, even offline or during power outages. 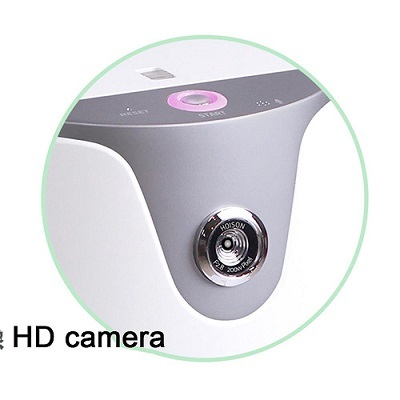 Interaction with WiFi: HD camera, high sensitive microphone, high DB speaker, real-time video and voice call. Wechat Feeding. Feed your cat or take photos of your pet through your Wechat account. Smart Light. You can remotely turn on the light of your feeder through App. Good to use at night. Time & Quantity Plan. 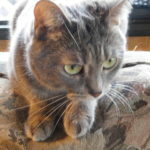 You can program a feeding schedule according to your cat’s eating habits and needs. Accurate Measurement. Weigh sensor allows you to monitor how much food is left in the feeder, up to a 2g error. Health Management. The feeder registers how much food your cat ate within a week and it suggests you a healthy feeding plan. It stores this data using the Cloud service. Cloud service. You can login and use the power of the Cloud. Share your pet’s pictures on social media and add family or friends to monitor and take care of your pet as well. Offline feeding. Internal battery allows the feeder to dispense automatically if internet or power goes off. Hoison automatic feeder features an anti-jamming system that allows the food to pass through without getting stuck in the feeder. The motor uses 5V and it has 6 revolutions per minute. The feeder is almost a one-piece device made from FDA approved plastic, only the food hopper is removable. 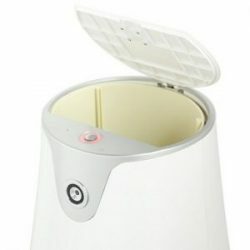 The unit has an emergency internal battery that allows the feeder to keep dispensing in case of power outages or if the feeder loses internet connection. This battery lasts up to 24 hours. In case of loss of signal, Hoison feeder has a special auto connect system that keeps the unit connected without the need of restarting it. You can monitor how much food there is in the feeder with a 2g margin error. An alarm tells you when there is not enough food. You can see and hear your cat in real time. Your cat can hear you as well. Only food hopper is removable. There is not very much technical information in English. You need to change the time zone to yours on the App. Hoison Automatic Pet Feeder is a smart device with a wide range of functions to give you full control over your pet’s feeding. This unit is an option for busy people that need to be in contact with their pets when working, traveling or simply when going. However, the feeder has some issues such as lack of good technical information in English and the time zone due to the Chinese App used with this feeder. Also, this automatic feeder has been introduced to the market with Beta versions in order refine the ultimate version of the feeder. If you don’t want to adjust the unit’s time zone. If you want in-depth technical information in English. If you want a feeder that keeps the food sealed. A couple of questions – was this feeder able to keep cats out from breaking in and/or tipping it over? Would this be usable for 2 cats? Hi Randy, this feeder can feed two cats at the same time and even though it’s sturdy some cats may try to get extra kibble if moving the tray enough with their paws to get some kibble falling onto the tray. But not all cats do this, it’s just a matter of how obssesed with food your cat is. Hope that helps! How many litres or kg of dry food does this feeder hold please? I cant see the holding weight mentioned on any of the reviews? This would be the no.1 feature for most people. Hi Tanya, the capacity it’s stated on this review. It is 4.4 lbs. Hi George, plastic feeders like the Hoison have a risk of being damaged by dogs with powerful teeth like yours. I don’t know if your dog will destroy the feeder or will just eat from it, pets are unpredictable like that. It’s a good idea training your dog to respect the unit at the outset with strong commandments. Another idea would be to get a flatter sturdy unit like the Feed & Go which is harder for a dog to tip over or chew on due to its design. Check a review of this unit here. I hope that helps!